Soon you will be taking your baby home from the hospital. The best way to ensure that your baby arrives home safely is to use a safe and properly installed car seat. Every state has laws that require infants to ride in car safety seats. For the best possible protection, keep your infant in a rear-facing child safety seat in a back seat for as long as possible--up to the height or weight limit of the particular seat. For many children, that will be 30, 35, or even 40 pounds. Many kids will be over 2 when they reach that weight. Rear-facing occupants are safest. Read the car seat instruction manual carefully. Practice putting the car seat in and out of the car before bringing it to the hospital. Always use a car seat. Never hold your baby on your lap. A rear-facing car seat must not be placed in the front passenger seat of any vehicle equipped with a passenger side air bag. If your vehicle has side impact air bags, make sure the car seat is secured in the middle seat. The middle back seat is the safest location. Never leave your baby unattended in the car. Cars can heat up fast in the sun, and a baby can overheat quickly. Never buy a used car seat if you do not know the full history. Never use a car seat that has been in a crash. All car seats have an expiration date. Generally, it is six years, but you should contact the manufacturer of the seat to find out what the expiration date is for your specific seat. Use your baby's car seat rear-facing and semi-reclined no more than 45 degrees, so that the baby's head stays in contact with the seat and the baby's airway stays open. Make sure the car seat is buckled securely in the car. 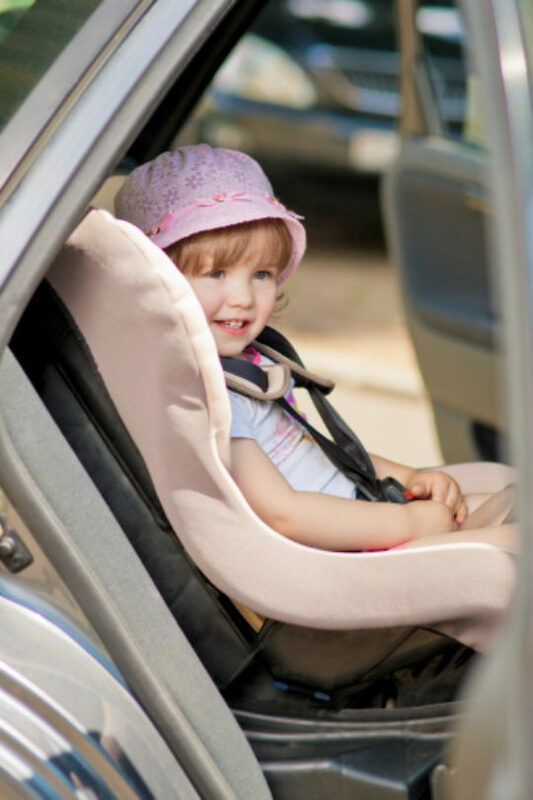 If you can move the car seat more than an inch side to side or toward the front of the car, it is not tight enough. If you need help installing your car seat, contact a certified Child Passenger Safety Technician at 1.866.SEAT-CHECK (1.866.732.8243) or visit www.seatcheck.org. There are two types of rear-facing car seats: infant-only car seats and convertible car seats. Convertible seats can be used in rear-facing mode for infants and then converted to a forward-facing position once the child has outgrown the rear-facing weight or height limit for his or her seat. These models are small and have carrying handles. Use rear-facing for infants up to 20 pounds. Some models go up to 30 pounds. A 5-point harness is preferred. Keep chest clip at armpit level, not on the neck or tummy. Newborn infants should have a 45-degree maximum recline. Built-in indicators and adjusters help get the correct recline. Most models come with a detachable base that can be left in the car. The car seat should click when placed firmly into the base indicating it is locked. Infant-only seats may fit newborns better than convertible car seats. Convertible seats are used in rear-facing mode for infants from birth to at least 1 year and at least 20 pounds. The seats can be used in forward-facing mode for older children. These models have higher rear-facing weight limits than infant-only car seats, with some going up to 30-35 pounds. These models should be turned front-facing at the 30-40 pound weight limit or if the child's head is within one inch of the top of the seat. You should keep harness straps at or below the shoulders while rear-facing. You should keep harness straps at or above the shoulders when forward-facing. Models with a 5-point harness and a front adjuster strap are preferred. A 45-degree maximum recline is needed for newborns and infants while rear-facing. Older babies with good head control can have less recline while the seat is in rear-facing mode. Upright with no recline is best when these seats are in front-facing mode. If your child was born prematurely, you may need to take special precautions to ensure safe transportation. It is hard for some premature babies to breathe when they are sitting up. For this reason, babies born prematurely will be given a "car seat test" before they are discharged. The nurse will monitor your baby in their car seat for an hour. The doctor will evaluate the data from the test and let you know if it is safe for your baby to travel in a car seat. In some instances, babies are unable to breathe properly in a regular car seat and need to travel in a car bed, which allows the baby to lie flat while still secured safely. If you have any questions, talk to your baby's nurse or doctor. Infant-only car seats are best for premature babies. Use a car seat with a distance of less than 5½ inches from the crotch strap to the seat back. This reduces the potential for your baby to slump forward. Try using a small rolled diaper or blanket between the crotch strap and your baby to reduce slouching. Choose a car seat with a distance of less than 10 inches from the lower harness straps to the seat bottom. This reduces the potential for the harness straps to cross your baby's ears. Place rolled receiving blankets on both sides of your baby to center him or her in the car seat. This will prevent the baby's head from falling to the side, which can kink the windpipe. When rear-facing, set the shoulder straps in the lowest slots until your baby's shoulders are above the slots. Do not wrap your baby in a blanket before buckling him or her in. The harness will not fit correctly. Buckle your baby in, and then put the blanket over the baby. Do not use a car seat with a shield, abdominal pad, or arm rest that could come in direct contact with your baby during an impact. If your baby requires close observation, travel with another adult who can sit in the back seat next to your baby rather than putting your baby in the front passenger seat. If your baby is sent home on an apnea monitor or oxygen, store the equipment on the floor of the car, not on the seat next to your baby. If you have to stop suddenly, the equipment could injure your baby. You can get this information from the National Highway Traffic Safety Administration website.